An inductive sensor or inductive proximity sensor is a non-contact sensor used to detect and position metal objects. Depending on the type of metal that’s being detected, inductive sensors will work at a variety of ranges. Metals like aluminum or copper have a shorter detection range because they are non-ferrous, and ferrous metals like steel or iron have a longer sensing range, allowing for more flexibility. Inductive sensors are reliable in that they’re able to repeat specific functions with precision and consistency. In this blog, we’re going to talk about some of the main applications of inductive sensors during the packaging process. If you’d like to speak with an engineering consultant, don’t hesitate to contact Dynamic Measurement & Control Solutions. We are always on hand to discuss electrical and mechanical engineering solutions and their applications across various transportation and manufacturing industries. One of the most common and recognizable applications for inductive sensors is for position detection on a mechanical moving part. If you’ve ever gone to the grocery store and looked at products like soda cans or juice cartons, you’ve probably wondered how hundreds of thousands of these containers can be filled every day with little error. Inductive sensors are one small yet important part of this process and are responsible for the consistent alignment and follow-through function while these containers are being filled. As a result, factories can expect to see fewer interruptions and less wasted materials while using inductive sensors. In today’s manufacturing industries, there is a wide range of different foil seal materials in use. Traditionally, photoelectric sensors were used to ensure that products were sealed properly before being sent to stores. However, these sensors are incapable of keeping up with modern demands. Inductive sensors, on the other hand, have proven to be a reliable and efficient means of detecting the presence of foil seals. One important thing to note is that a well-manufactured inductive sensor is highly resistant to wear compared to other types of sensors. In high-hygienic processes like yogurt production, factory lines regularly switch between ingredients and cleaning solutions. Although something like a mechanical limit switch could be used in this situation, an inductive sensor will prove to be more resistant to wear and thus assure long-term success. Aside from the detection of the products themselves, inductive sensors can also be used to monitor the precise position of gears on the conveyor system. If the operator needs to stop the conveyor belt for any reason, inductive sensors will provide reliable information in order for the process to be restarted quickly and correctly. 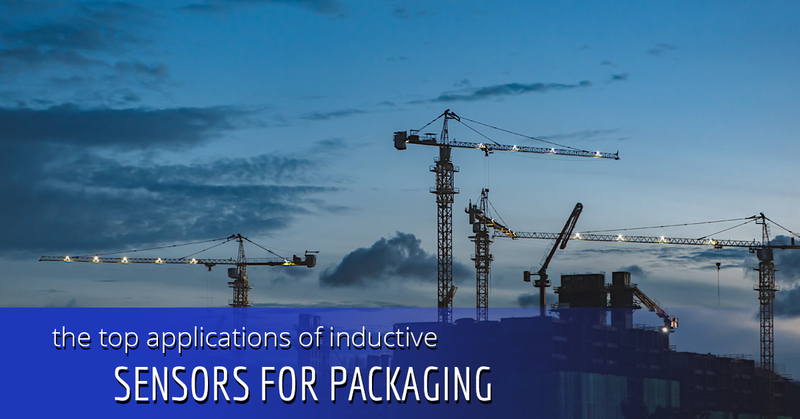 These are just a few of the applications of inductive sensors for use in packaging. Stay tuned to our future blogs if you’d like to learn about the use of inductive sensors in other industries. If you’d like to speak with an engineering consultant, contact us today. We would be glad to work with you and determine what type of sensor you need and direct you to the appropriate manufacturer.